Our Second eNewsletter is out! IT'S OFFICIAL! We have our IRS approval! This just in! 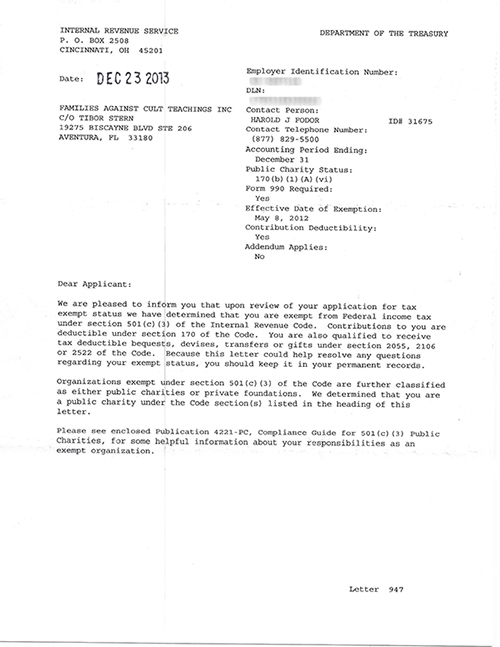 The IRS has finally approved us for our 501(c)(3) non-profit tax exempt status! We are now able to raise the funds necessary to help more families and kids in need. What a great way to start off the New Year. Stay tuned for updates! Our First eNewsletter is out! I don't know if you realized who am I in our short acquaintance...It's very hard for me to stand, hear, watch this whole tragedy. My heart aches to think of what are you going through. I know your pain, and feel it in my body. Sharoni's story shook and is still shaking my soul deeply in ways and forms that are hard for me to describe. This story had disturbed me both emotional and mentally, and not because of my acquaintance with the devil "master Katsura Kan". It bothers me and hurt me and I identify with Sharoni's world and wishes, as I told you already, we both desired the same thing. Creative fulfillment of the depth of the soul. l also thought that through Butoh I will achieve this dream. It's hard for me to write to you, only yesterday I had met Hana, the special and charming woman, I can not endure it and can not cooperate with you, I am not strong enough to contain this. After the meeting with Hana I felt sad. Your pain and the war against the "Master" revives in me places and pains that I can't absorb this time in my life. I am not strong (like [name removed]) My nerves are exposed I have no protection and this, how should I put it, is dangerous for me (at least right now). I am a divorced mother of four who is currently experiencing the nightmare of having my son join a cult. Although, my son is considered an adult in the eyes of the law; unfortunately, his identity has been altered by subjects of mind control. The person my son was a two years ago, is not the person I raised. His identity has completely been altered in every way that matters. The son I know would never leave his friends and family behind. What makes this situation more severe and serious is my son has two medical conditions; one is Bipolar, the second, is Crohn’s Disease. I have sought help from local and state and federal law enforcement agencies, without success. I have even gained temporary custody of my son this past November, 2011. In addition, I had also placed a temporary restraining on these two individuals while my son was in Butler hospital, to keep them away from my son. Every passing day increases my family’s distress and the extent to which [name removed] gets drawn deeper into this cult. I went to great lengths, heartache, struggle, and turbulence to save my son, with no great outcomes. The couple have gone through great length to keep my son from friends and family. His father and I raised him to be responsible, and we did our best to give him a bright future with our limited resources. [Name removed] is a bright, personable and easy going young man. He came into contact with this local cult whose members brainwashed him to such an extent that he is estranged from me his mother, his father, his siblings and friends as well as all the members of our extended family. His ambitions was to be a doctor and, like all young men his age, loved to listening to music, dancing, and spending time with his friends. He had a job to help pay for his expenses and was to attend college in September, of 2011. All of this changed when he came into contact with this cult which seems to have cast a magic spell on him. He is currently living with them and we have not seen or talked to him for a long time. With everything that I have done involving the local authorities, courts, professional medical advisors, lawyers and PI, nothing has worked. Each night I think of my son and pray for him; each morning I cry for him. The couple who call themselves QueenMah and KingDah do not want my son [name removed] to have any contact with his old life, which means no contact with friends, family, or even his own mother. Not only do they not want any contact, but they also have went as far as to hide any of their YouTube videos they made; including, four of them involving my son just this past February, of 2012. I have made many attempts to get help and resources from the local media with failed outcome. The couple have these bizarre beliefs that they are vessels, and speak through the word of God. Their real names are Ervin and Shiketa Battle, date of birth: 11/21/1975 for Shiketa, and 04/04/1968 for Ervin, but go by the name KingDah and QueenMah Love. They seek young adults who are impressionable, and quickly isolate them from family and friends, in order to gain control of them. Consequently, the couples have chosen my son to call as their own child; and they have given him a spiritual African name called [name removed], and use him to recruit others. Most importantly, they have also altered his appearance and demeanor, by making him act and think differently than his usual self, ([name removed] acts like them, dresses like them, and thinks like them). Also, they have even changed his diet, by telling him that the foods that we eat are not good or pure; as a result, he has to eat food that will cleanse his body and soul. I also believe there is some sexual and perversion going on between them and my son. What upset me more than anything is that these two individuals have told my son that in order to not lose his soul…he needs to isolate himself from his own family and friends…because others don’t think the way they do. According to them, the rest of us are all “demons who will never see the face of God”. And what is frightening and dangerous, KingDah and QueenMah have told my son they have cured him of his Crohn’s disease and that he no longer has it. I have even hired a detective and paid a lot of attorney fees, with no success. The only thing they did was rob a single mother who has limited resources to financial means or knowledgeably recourse about the system. Now as a parent, I am concerned about his health, safety, and wellbeing. If I thought for one moment that their intentions were good, I would not interfere with my son’s life. After all he is an adult now and as such he has the right to make his own decisions in life. All I want is for him to be a part of our life and be free to have his own will, without influences from the cults. To read the first six pages of the lawsuit against this cult leader, click here. I first met Sharon for a session while she was in college, if my memory serves correctly, for one session. She presented herself as a confident individual with an air of clarity as to who she was and with clear vision. She came to see me because her parents thought that she could use some guidance with her career goals. It was then years later that I saw her at her brother Ronny's wedding. On February 27,2012 I was surprised to see her in my office with Ronny. I spent the whole session catching up with her over recent life's events. Clinical impressions suggested a young woman who appeared to be tired, physically unattended to herself, flat affect, low energy, pessimistic with a deep sense of failure and resignation. She was upset and weepy. I discussed the therapy process, psychotropic medication if needed. She become upset and rejected any discussion about meds. The session on February 28,2012 was with her parents. Sharon become hostile, angry, and lacked control over her emotions. She felt hurt, betrayed, anxious and scared. She was clinically fragile with marginal defense mechanism. Her reality testing was tenuous. During her individual session on February 29,2012 her clinical intake suggested depressed mood, loss of interests in activities that at one point were of great interests to her, and loss of pleasure. She admitted to feeling sad at times, irritable, low energy, low self esteem and self worth, a deep sense of failure, recurrent thoughts of death, guilt and shame. Sharon repeatedly denied suicidal thoughts.intention, plan or desire to take her life. She stated ttl am too scared" in regards to taking her life. Her thoughts about dyeing were more about the struggle of living rather than her desire to end her life. I brought up the idea about medication and encouraged her to consider the chemical component of her clinical Major Depression. Her resistance remained very high and rejected the idea of medication. During the sessions on March 1,2012 and March 20,2012 with her parents Sharon continued her reactivity, edginess and high distrust of her parents and society at large. She was extremely apprehensive to being Baker Acted again and had a paranoid suspiciousness of police. She continued to resist going on medication. Her parents become frustrated anxious and helpless to effect Sharon's compliance with the therapeutic efforts. She finally consented to go to meet with Dr. Fernando Pomeraniac, Psychiatrist. On her visit on March 7,2012 she began to read David Burns book The Feeling Good Handbook. She reported "it is cheesy" She also had not called Dr. Pomeraniac. She acknowledged her difficulty in committing to her treatment. She expressed her fears of jail, mental illness, death, as well as, homelessness. She appeared less anxious, calmer at this session. Mental status appeared to be intact. On her visit on March 8,2012 she suggested ' I fell in love with my teacher Kan". According to her Todd has supported her passion for dancing. She admitted that" I did not focus on anything else except dancing, self and grad school". She expressed that" Kan thought me to be selfish. He was a passionate lover and father figure. I was torn between two lovers. "She admitted feeling guilt and remorse. She explain her first attempt to harm herself in this session by narrating her thoughts at the time" who will want a chronically depressed suicidal woman?" According to her she felt" unwanted and unloved anywhere". Again we discussed medication and the outcomes. It was evident that her resistance was based on the believe that if she gets on medication it would devalue her even further and push her away from her goal to appear more stable to Kan so she could continue her dance and be part of his life. On March 12, 2012 Sharon admitted that she could not take care of herself, she suggested" I am a spoiled brat". She acknowledged her dependencies on her parents, Todd and Kan. Sharon appeared more stable and calmer in the session. We discussed dependencies and the path to becoming a grown up. Focus was on taking responsibility for her life and creating her own destiny. She denied any thoughts, plan or intentions to hurt herself. On March 13,2012 Sharon had gotten involved with Feeding America, and she began to volunteer her time. She sounded sad and appeared to be grieving.She spoke about her first Major Depression episode. She was worried and felt abused by others in the Butoh community. She did not like Dr. Pomeraniec. He had prescribed Ability for her. A referral was then given to her to see Dr. Carolyn Leavitt and Dr. Eva Ritvo to help make her mind up which one of them she could work with. Both women are Psychiatrist. Sharon denied any thoughts, plan or intentions to hurt herself. She responded to physical affection and encouragement at the end of the session. On March 16,2012 Sharon informed me that she had begun taking the Ability however, admitted that she had not been fully compliant. She complained that it was making her feel very tired. It was evident that she was not happy about taking medication. She admitted to having nightmares but could not recall their content. She felt lonely and unmotivated." My need for perfection, my past love pattern, I chase them and once I get them I lose interests.". She talked about not showing up to her appointment with Dr. Pomeraniac. On March 21,2012 we continued to discuss her resistance to Medication. She understood the importance of her Medication to her treatment plan. She suggested again taking then will confirm her fears * I am not o.k who will want me?". We were able to confront her irrational believes, however, she did not change her ideation. She stated "I feel I am in emotional 911 since 2011.". Her vulnerabilities were evident. She felt helpless to cope with what she knew was an unhealthy state of mind. She struggled with seeing how her actions effected her outcomes. On April 06 she returned from a trip to Bolder Co. to see Todd. She reflected "He has no interests whatsoever.". She become emotional, vulnerable, projecting into the future and fragile. Her sense of trust has been marginal. Discussed her feelings of guilt over how she treated Todd and her betrayal of him stating "All I wanted is to be married to Todd and be a mother". She suggested that she began taking the Ability .however was not taking it consistently. I urged her to see Dr. Ritvo or Leavitt. On April 09,2012 she was emotional and negative. She admitted to over sleeping. Discussed her clinical picture. Again I encouraged her to consider the medical component of her condition. She appeared to listen .She had decided to travel to Brazil for one month. It was discussed that the timing given her clinical condition, her medication, and therapy was not appropriate. She suggested that she wanted to dance. For her the solution to her life's issues at that time was to Dance - Butoh. She was afraid of cops, Civil Commitment. She was referred to Dr. Leavitt. Sharon called Dr. Leavitt. Dr. Leavitt called her back offered Wed. the 11 of April to see her. Dr. Leavitt was waiting for a call back. On April 11,2012 She decided to go to Brazil. Discussed her decision with all the choices available to her She appeared reserved and in control, rational with her plan. She stated that she had thought it through and was eager to leave on Sunday. She set up appointments over Skype for Wed. April 18. She promised to call by Monday the 16th to confirm. On April the 13th I received a call from Chana informing me that if Sharon does not keep her appointment on the 18th that Ronny will take the session. On April 19,2012 sent an email to Sharon confirming her next appointments on the 23rd and 25th. On April 23 2012 I responded to Sharon who apologized for not being able to keep her appointment on that day. She stated that "I have a job". She sounded optimistic. The following clinical impressions are based on clinical observation and interactions with Sharon, her family and email correspondences. These conclusions are based on the above data and within reasonable psychological probability. She has suffered from Major Depression, Borderline Personality Disorder and PSTD. He misuse of power, ignoring her physical, and psychological health. He endanger her physical safety. He abandoned her after she was pleading for his help. He betrayed her trust. Promise of love and a life together. He turned her against her family. He ignored change that he saw in Sharon from 2010 to 2011. He was controlling, threatening, abandoning, intolerant, punishing, insensitive and lack of empathy. He "broke" down her body and soul. KAN. In her mind there was No Way Out. I hope this information is of value to you. To download a copy of the evaluation letter from Sharoni's Psychologist, click here. If you are not familiar with the entirety of Sharoni's tragic story, click here to read it. I was so sad to hear of the loss of your daughter Sharoni. Please except my deepest condolences. I lost my daughter Jamie 3 years ago. She was very good friends with many of the girls from Hillel. My daughter was involved in what I considered a cult. She married her childhood sweetheart. He married her for her money, and her kindness and sweet heart. She was very intelligent, with a with a business degree and was a registered nurse. He manipulated her for years and got her involved in drugs and put heroin in pot without her knowing. We did not know she was in trouble . We found out he was using in drugs at the same time he was in medical school. We asked Jamie if she was involved but she said no. We put him in a private rehab facility. He never was said Jamie was in trouble. He told her he would get better and she would be fine. Two years later Jamie called and came home. She still did not tell us she needed help. She got divorced because her was a bad man and she finally realized it. Several months later we discovered Jamie had a serious drug problem. Jamie spent almost 8 months in rehab. She was loved by everyone there, and so respected. Two months after she left rehab she had an accidental overdose. They told us she had such a tiny amount of drug in her system but her body was so clean that she died right away. Her x husband knew she was getting drugs and never tried to stop her or call us. There is such evil in the world. We worked with the DEA to try to get this bad man under control and the people who sell drugs. Three years have passed and there is not 1 day that I do not miss or think about my Jamie. I am so grateful that god put her in my life and I feel so blessed for the time that I had with her. I hope in time you and your family will find some peace. This not the first time a Naropa faculty member created such problems. It was in fact much more prevalent in Naropa's early days when even its founder ran amoc. Read "When I Was Cool" by Sam Kashner. Your clarification explains KK's behavior when I and a colleague talked with Sharoni after a performance at Cornish in Seattle in summer 2011. I studied at Naropa only as an older student who refused to allow teachers to be god-like. For what it is worth I see butoh as a very dark form of dance. Having said that Sharoni was one the best I have seen, and I always felt that when she got there she gave Naropa's program validity. Until Sharoni that program was run by an egotistical idiot. Note: Writer's name has been removed to protect their identity. My heart goes out to you and your family. I feel your grieving process so strongly, and I think of you often. I want to thank you for posting this letter with such profound updates. Lots of this new information I was unaware of and it literally shakes me to the bone. I feel all of this destruction now more then ever, and I want for you to know that I support you and Hana in whatever ways that I possibly can. I am reminded often of how supportive you and Hana were for me this past summer. It's chilling for me to reflect on to be honest. Here you were mourning the tragic death of your daughter, yet you were so fully present for a stranger in desperate need of a validation to live. Your e-mails and phone calls to me meant more to me then perhaps you know. You both were there for me in ways that my own parents couldn't be there for me. For this I am forever grateful. Honestly, I never liked KK myself, even before any of this information on him became public. What he taught was just boring and of no value in my opinion, however he did have a mesmerizing stage presence....and this is perhaps that only element that attracted me to him in the first place....but I soon found out first hand that what he taught was quite superficial. You can trust that I will be discouraging folks from working with Kan, and will pass along your words in full justice and memory of Sharoni. Happy Holidays to you and your loving family. understand and accept my wish.